With just a few days until China’s largest retailer makes its debut at the world’s largest consumer electronics show, JD has launched two smart delivery stations in the cities of Changsha and Hohhot, strengthening the e-commerce giant’s autonomous logistics capabilities. The stations are carrying out R&D, testing and personnel training to solve issues related to last mile delivery. JD’s delivery robots can be loaded with up to 30 parcels before autonomously delivering them within a 5-kilometer radius. The vehicles can plan routes, avoid obstacles and recognize traffic lights. Facial recognition technology enables users to easily and securely collect their parcels. Running at full capacity, the delivery stations, operating with a half-half split between robots and couriers, can deliver up to 2,000 packages a day. As a global pioneer in developing advanced technology for e-commerce, JD will showcase the cutting edge technology that is already transforming the way consumers shop in China, and which will revolutionize global commerce. 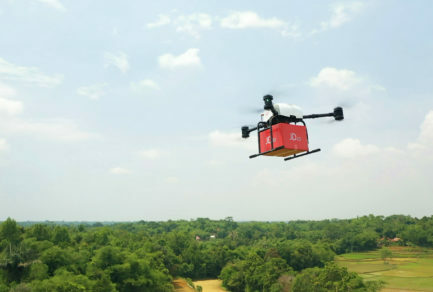 Visitors will be able to see how JD uses its drones to deliver consumer goods and medical supplies to remote areas in China, and catch a glimpse of the world’s first fully-automated fulfillment center. They will also see how underground urban logistics will make shopping more convenient than ever, and fundamentally alter how cities work. This year, CES attendees will be able to see JD’s futuristic technology up close and even try some of it for themselves at the company’s interactive booth. Aside from drones and delivery robots, visitors will be able to experience drone flights in virtual reality, as well as JD’s augmented reality fitting and styling software. They will also see how JD is developing Internet of Things technology that enables consumers to remotely control the smart devices in their homes, even from their cars. JD will also give people the chance to try a special exoskeleton worn by staff in JD warehouses that makes lifting heavy objects easier. Many of JD’s innovations are designed to realize the company’s Boundaryless Retail vision, in which consumers can buy whatever they want, wherever and whenever they want it. “As China’s largest retailer, JD is in the unique position of being able to research and develop, and commercially deploy, innovative new technology that is shaping the future of shopping worldwide,” said Chen Zhang, JD.com’s Chief Technology Officer. “As JD opens its technology up to other companies and industries, the features that we’ve already rolled out in China from automated warehouses to virtual shopping are going to be enjoyed by consumers everywhere,” Zhang said, referring to the company’s Retail as a Service, or RaaS strategy. JD started in 1998 as an offline electronics retailer, launching its online business following the SARS outbreak in 2004. At that time, China didn’t have well-developed logistics infrastructure, so JD made the bold decision to develop its own nationwide, in-house logistics network. Today, that network can deliver over 90% of orders same- or next-day, and covers 99% of China’s population. With more than 300 million active users, JD is China’s largest retailer, online or offline, and is the world’s third largest internet company by revenue. It counts Tencent, Walmart and Google among its strategic partners in revolutionizing global commerce.